How Safe is Your Sauna or Steam Bath? – CSA Safety Certification Approval. 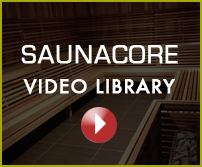 Safety is Saunacore’s number one priority when manufacturing its exclusive Canadian Made far infrared saunas, sauna heaters, steam bath generators and all its other components and equipment. ALL Saunacore products are CSA certified (excluding Sunset infrared sauna which is imported from China – ETL certified) to the most rigures testing methods, and to the most up to date safety standards on the market. CSA certification is concrete proof and assurance that your infrared sauna or any Saunacore products are tested to stringent safety standards. All precautions are documented, and certified and tested in CANADA. As a manufacture we have the power to make immediate and all necessary changes, alterations or corrections immediately to implement a safe product. Saunacore products are tested to CSA, UL and CE safety standards. Saunacore chooses CSA (Canadian Standards Association) to test and certify all Saunacore products. This is why. Thousands of companies rely on CSA International for product testing for the U.S. and Canada-including American Water Heater, Apple, Bata, CFM Majestic, Delta Faucet, GE, Hewlett-Packard, Hubbell Lighting, Hobart, IBM, Intermatic, IPEX, Kaufman, Lennox Industries, Mitsubishi, Moen, North Safety, Sanyo, Whirlpool, and others. Major retail chains carry a multitude of products bearing the CSA marks including Best-Buy, Canadian Tire, The Home Depot, JCPenney, Lowes, RadioShack, Sears, Spiegel, Wal-Mart, and many others. CSA International is accredited in Canada by the Standards Council of Canada (SCC) and is recognized by the Occupational Safety and Health Administration (OSHA) as a Nationally Recognized Testing Laboratory (NRTL). CSA marks are accepted by Regulatory Authorities in the occupational health and safety, electrical, gas, building, plumbing and many other fields in the U.S. and Canada. CSA marks mean a product has been tested and meets applicable standards for safety and/or performance, including the applicable standards written or administered by the American National Standards Institute (ANSI), Underwriters Laboratories (UL), Canadian Standards Association (CSA), NSF International (NSF), and others. 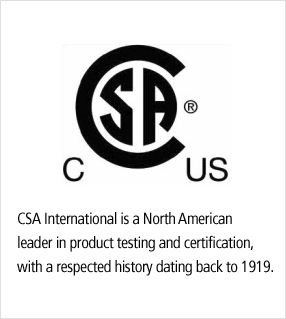 CSA International is a North American leader in product testing and certification, with a respected history dating back to 1919. CSA works closely with the International Association of Electrical Inspectors (IAEI), the Electrical Safety Foundation International (ESFI), Health Canada, provincial regulators, and the U.S. Consumer Product Safety Commission (CPSC) to promote standards for consumer safety in North America and around the world. CSA field representatives conduct more than 50,000 factory visits each year, worldwide, to ensure that CSA-certified products continue to meet the applicable standards. Accreditation demonstrates that CSA is fully qualified to test and certify your products, and that the results are widely recognized in our chosen markets. CSA certifications are used and accepted across North America and around the world, on over 1 billion products. And that number continues to grow. In the U.S., CSA International is recognized by the Occupational Health and Safety Administration (OSHA) as a Nationally Recognized Testing Laboratory (NRTL). Generally speaking, all OSHA recognized laboratories conduct their tests against the same sets of U.S. standards and codes, regardless of who authors or publishes them. CSA International tests to applicable U.S. standards, which include ANSI, UL, CSA, NSF, and others. In Canada CSA International is accredited as a Certification Organization (CO) and as a Testing Organization (TO) by the Standards Council of Canada (SCC). The following chart lists some of the organizations in alphabetical order that have accredited CSA International in the various product categories. Automotive, special vehicle, motorcycle, bicycle lighting and safety equipment. products; natural gas-fired appliances and accessories, sanitation programs for commercial food preparation equipment. gas/electric-type products and precast/prestressed concrete products. National Institute of Standards and Technology (NIST/NVLAP) Electromagnetic compatibility and telecommunications FCC and Commercial products testing. fields of testing; inclusive of Construction, Environmental and Occupational Health and Safety – including gas, oil fired and solid fuels appliances. under EPCA in accordance with 10CFR Part 431. "I really appreciate the high-quality heater and top-notch customer service while putting together our new sauna. "